Attending authors known at publication include Special Guests of the Convention Richard Kadrey (Sandman Slim), Christine Feehan (Dark Series), Jeffrey J. Mariotte (Season of the Wolf), Neil Gaiman (The Ocean at the End of the Lane), Duane Swierczynski (Chris Hardie Triology), and Leonard Maltin (Leonard Maltin’s Movie Guide 2013). Other authors who can be found at panels, signings, and otherwise participating in the convention include John and Carole Barrowman, Ally Condie, Brandon Mull, S.G. Browne, Seanan McGuire, Django Wexler, Jim Butcher, Ann Aguirre, Patrick Rothfuss, Gini Koch, Jonathan Maberry, Christina Lauren, George R.R. Martin, Terry Brooks, Holly Black, Cassandra Clare, and Hope Larson. Plus 125,000-odd fans and more pop culture than you can imagine! Mysterious Galaxy will have books by many of the above authors in Booth 1119, along with special goodies from publishing partners Penguin Group and Simon & Schuster. You can also find us in publisher booths in the Exhibit Hall, and of course upstairs supporting many author signings in the convention’s autograph area! Christine King was born in California, USA. She grew up with 10 sisters and 3 brothers. She spent a lot of time getting in trouble at school for writing instead of doing the things she was supposed to do. Later she forced her ten sisters to read every word. She said: "I've been a writer all of my life -- it is who I am. I write for myself and always have. The ability to create pictures and emotions with words is such a miracle to me. I read everything. I mean everything. All kinds of books, even encyclopedias. I am fascinated by the written word and I love storytellers. It is a great privilege to be counted one myself." Living in the beautiful mountains of Lake County, she always loved hiking, camping, rafting and being outdoors. She has also been involved in the martial arts for years - she hold a third-degree black belt, instructs in a Korean karate system and has taught self defense. She published her first novel Dark Prince in 1999, starting a paranormal saga. Her debut novel won 3 of the 9 Paranormal Excellence Awards in Romantic Literature for 1999. She also has earned 7 more PEARL awards. She has received numerous honors throughout her career including being a nominee for the RWA's RITA and receiving a Career Achievement Award from the Romantic Times. Christine is married to Richard Feehan, together they have 11 children (each had children from previous marriages), and now also numerous grandchildren. They all keep her very busy. Today, her lovely daughters read and help her edit her manuscripts. Christine Feehan's book Fire Bound was available from LibraryThing Early Reviewers. 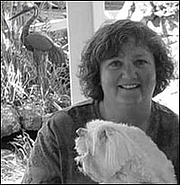 Christine Feehan is currently considered a "single author." If one or more works are by a distinct, homonymous authors, go ahead and split the author. Christine Feehan is composed of 10 names. You can examine and separate out names.